Welcome to the worlds greatest guide to Women's Argyle Sweaters. Are you actually looking for Women's Argyle Sweaters? Well, we hope you are because the reality is that you have found our Women's Argyle Sweaters page. A sweater is a garment intended to cover the torso and arms. A sweater is either a pullover or a cardigan, distinguished in that cardigans open at the front while pullovers do not. In British English, a pullover may also be called a jumper or jersey. 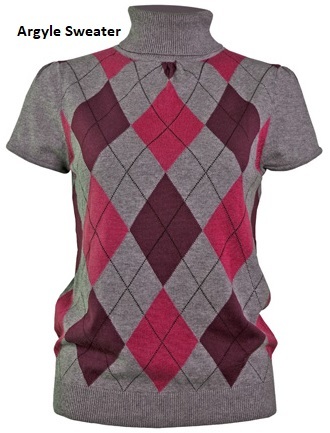 An argyle sweater is one made with an argyle pattern. An argyle pattern is made of diamonds or lozenges. The word is sometimes used to refer to an individual diamond in the design, but more commonly refers to the overall pattern. Most argyle contains layers of overlapping motifs, adding a sense of three-dimensionality, movement, and texture. Typically, there is an overlay of intercrossing diagonal lines on solid diamonds. See our argyle socks page for more details about the diamonds and lozenges. An argyle sweater showcases the argyle pattern. It generally has the appearance of an even-length pattern of diagonal checkers. What ever style of sweater you are wearing is in fashion this season. You do realize that not only sweaters are made with argyle. You may also have interest in argyle socks.